Review: My skin is sensitive and reacts immediately on any harsh cosmetic products. I feel I’m going to be a decent tester for products labelled “for a sensitive skin”. Getting a good face toner is a very important element of my face hygiene routine. 2-applying with a cotton pad or with my fingers a face toner-usually without alcohol-as this ingredient causes dryness of my cheeks skin. 4-applying a face cream relevant to the type of my skin and a time of a day-day or night one. Day one with SPF at least factor 15, but in the city it can be higher, especially in summer. Radicals and sunshine are killers for a young-looking face. 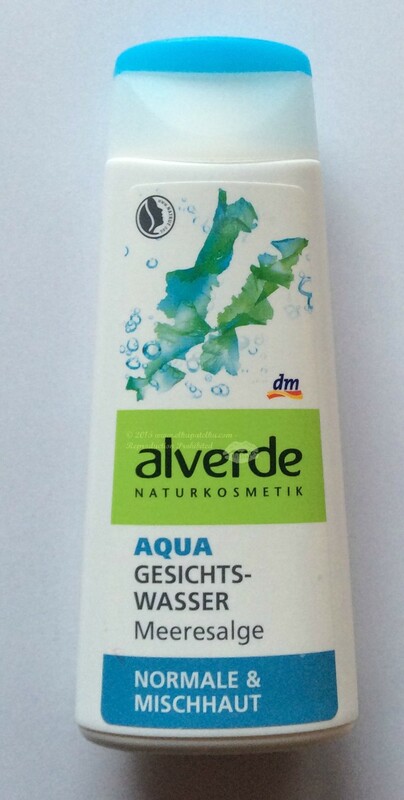 Alverde Aqua Gesichtswasser Meeresalge contains alcohol-known for its disinfecting and drying out effect, and also a seaweed known for its moisturising effect. Alcohol is a second ingredient on the list and you can really feel it. It clears the face well, but it causes also a bit of dryness on my cheeks, so I am not sure if I will be back to that product. However, seaweed give this toner an extreme freshness feeling while you’re applying it. It is like a breeze – a really cool feeling – and definitely good for summer. Unfortunately, I used it for the first time when it was a minus 10 Celsius degrees outside and during a heating season, in winter, while on holidays in Germany. It was a bit too harsh on my skin, but now-when its milder outside-the temperature differences are not so high-my skin does not react so strongly. Moreover, it cleared all tiny problematic areas, as alcohol dries them out completely, which is a big plus. Last but not least, I have a bit of mixed feelings about its moisturising effect. Can it really moisturise with such strong alcohol action? I am not convinced yet, but still have a half of the bottle to finish. I will add an update if I see any spectacular effects at later stage, but this review is written after using a half of Alverde Aqua Gesichtswasser Meeresalge. This product did not convince me to change my mind and switch to face toners with alcohol, but perhaps might be the right one for you? Give it a try or share your opinion with me if you used it. Give it a try if you have DM drug store nearby (or you travel through Austria, Germany , Czech Republic, Slovakia, Hungary, Slovenia, Croatia, Serbia-those are the countries where DM has its supermarkets with those lovely products Alverde brands). 4=I like it, its good. 5=Very good, but not ideal. This entry was posted in Alverde, Face toner and tagged alcohol toner, Alverde, DM Drogerie, face toner for sensitive skin, Gesichtswasser, sensitive skin, tonik do cery wrazliwej, vegan face toner.